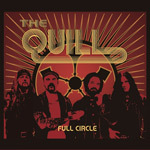 After a nearly five year hiatus, Swedish rockers The Quill return with their sixth album Full Circle, and introduce new singer Magnus Arnar. With a new singer, possibly 'full circle' has more than a titular meaning for The Quill. Certainly, one song, Bring It On, defines the attitude of this album. The Quill offers take no prisoners heavy rock doused with the gasoline of stoner and post-grunge rock. Full Circle is pretty much all bark and bite from from beginning to end. Sleeping With Your Enemy, Full Circle, 24/7 Groove, and More Alive are examples of Quill showing their indefatigable heaviness through a massive bottom end and gargantuan riffs. But The Quill is not without intrigue and rock accessibility. Black Star experiments with a little Middle Eastern guitar on Black Star, which will likely give the obsessive stoner a woody. This song and the following Medicine have substantial, and catchy, rock paces that make them heavy rock ear candy. If there can be a heavy/stoner rock ballad then No Easy Way Out comes close, sounding like a cross between alt rock and southern stoner rock. Speaking of the alt rock thing, Waiting for the Sun smacks of modern rock with more heaviness in a post-grunger wrapper. While this genre is not at the top of my favorites list, The Quill certainly offers prime material: sort of a mash up between Foo Foo Fighters and Queens of the Stone Age. Full Circle can be equally explosive and entertaining while always heavy. Check out the return of this fine band. While this genre is not at the top of my favorites list, The Quill certainly offers prime material: sort of a mash up between Foo Foo Fighters and Queens of the Stone Age. Full Circle can be equally explosive and entertaining while always heavy.